Hundred-and-fifty-year-old cannons and threadbare Confederate uniforms are a lot more exciting than they sound, and our recent trip to Gettysburg, Pennsylvania yielded up an exciting adventure filled with outstanding restaurants in historic buildings, a rare look into our nation’s history, and even a ghost or two. As we drove through the city for the first time, we got the feeling right away that there would be some hauntings. We were delighted by the historic architecture still in everyday use, and the surprising number of private homes that pre-date the Civil War. 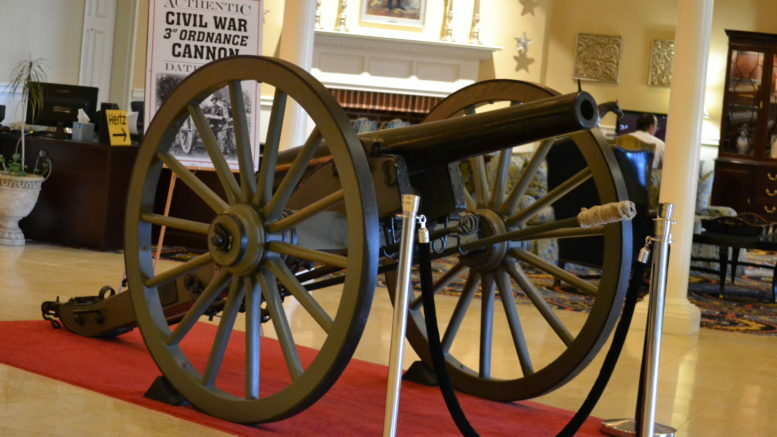 Reinforcing the history of the city, the first thing we were greeted with in the lobby of the Wyndham Gettysburg was a huge antique cannon. A pair of large wingback chairs in an alcove beneath a Civil War era painting completed the image, giving us the impression that we were back in 19th-century Pennsylvania, despite the modern conveniences the Wyndham offers. The first evening, dinner at the historic Dobbin House restaurant set the tone, and you may well get a few ghostly visitors to your table. Employees and guests alike have reported ghostly sightings, including fires being lit in the fireplace when nobody is there, and ghosts of children playfully engaging with other youngsters in the dining room. The restaurant, housed in the historic 1776 home of Rev. Dobbin, was used as part of the Underground Railroad prior to and during the Civil War. The secret hiding place can be seen during the free weekly tours of this incredible building. The restaurant itself maintains an early 19th century identity with waitresses in period costume, and a menu to match. The menu will throw you off at first, as it reproduces older English writing – with for example, the appetizer of the day described as “A generous offering difposed in a fanciful manner to dreff your table. Your servant will gladly defcribe the appetizer and its unique preparation.” Taking time to decipher the old language is worthwhile though, and the found the “Roast Duck Adams County,” a duck dish prepared with tart Adams County apples and hard cider with citrus herbs, to be truly one of the most incredibly delicious offerings of the entire trip. We strolled through historic downtown Gettysburg the next day, enjoying dinner at the Blue & Grey Bar and Grill with an order of “Rebel Yell” hot wings. The “Battlefield burger” selection offers a selection of Union burgers and Confederate burgers, and depending on which one you order, it’s served with either a tiny Union or Confederate flag on top. It may not be haunted, but it’s a fun time. You’ll find several different groups offering ghost tours. We selected the Gettysburg Ghost Tours offering on Steinwehr Street downtown and we weren’t disappointed! The night-time walking tour, led by a guide in period costume carrying a lantern, takes you to all the haunting hot spots in town, with a good selection of options. We selected the cemetery tour, which in addition to visiting three historic Gettysburg cemeteries, passed by the infamous Jenny Wade House, which was featured on the Ghost Adventures show on the Travel Channel. Jenny Wade was the only civilian casualty of the Battle of Gettysburg. Twenty-year-old Jenny was killed by a stray Confederate bullet while she was baking bread in her home, and there have been numerous sightings in the building. We didn’t see any ghosts, but as we walked by Cemetery Hill, we detected the distinct aroma of smoke and gunpowder, a manifestation the guide later told us was common throughout Gettysburg – possibly a spectral residue of the bloody battle that still persists to this day. After the tour, it seems one of the ghosts followed us back to the Wyndham, and we heard peculiar and playful noises coming from nowhere, as we walked back to our room. Pennsylvania’s Amish country is well-known for horse and buggies clomping down the city streets, quaint little shops and covered bridges, hand-made quilts, and home-made jam. But it’s also known for ghosts. There are plenty of historic bed and breakfasts to stay in around Lancaster, including the Speedwell Forge Bed & Breakfast, a 2017 HotelsCombined Recognition of Excellence award winner, the history of which dates back to the 18th century. The enchanting house was built in 1760 as Speedwell Forge, to take advantage of the iron deposits found throughout the region. Naturally, Lancaster has a ghost tour of its own, which takes you on a candlelight walking tour, where tour guides will give you a ghostly history of Lancaster that goes far beyond what you expect when visiting a historic Amish community. The guides are wonderful storytellers, making the tour fun and exciting. After a long day of buggy rides and quilt shopping, the ghost tour is just the right thing to cap off the day. Gettysburg is always a fun and exciting trip, but it’s not all museums and battlefields – and you may well meet a ghost or two during your stay.